You don’t have to be left out during the holidays or family get togethers. Adjusting your cooking to accommodate for side-effects from cancer and chemotherapy treatments can be a breeze. 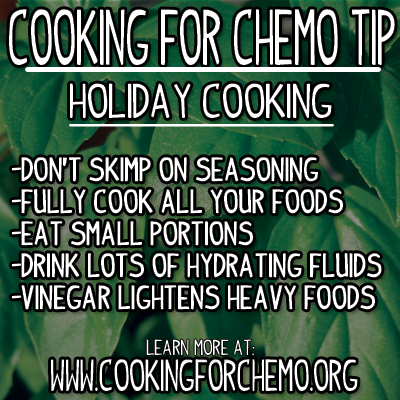 As we are heading into the holiday season, here are some cooking tips to keep in mind when cooking for cancer patients that are going through chemotherapy treatment. These cooking tips will help you combat and overcome those nasty chemotherapy side-effects such as metallic taste, loss of appetite, nausea, and mouth sores. 1) Don’t skimp on the seasoning! Remember to follow my seasoning methods from my cookbook, Cooking for Chemo …and After! (Salty, Savory, Spicy, Sour, Sweet) An important cooking tip to remember when you are preparing a whole turkey or ham is the seasonings that you apply to the outside, are the only seasonings you will be applying to the entirety of the recipe. In this scenario, it’s OK to slightly over season to make sure that the flavors work their way through the turkey or ham. Another important thing to remember when seasoning a whole turkey or ham is that most seasonings are water soluble not fat soluble. What this means for cooking is that a majority of flavor from seasonings will end up no deeper than 2 millimeters into the meat and the rest of the flavor will end up in the drippings. Salt is the big exception to this rule. Salt will naturally work itself through the meat through the process of osmosis. So if possible, salt rub your turkey or brine it the night before cooking. Last point, don’t throw away the pan drippings! This is where your best flavor for making gravy, soups, or stocks will be. 2) Make sure your food is fully cooked to proper temperature to avoid food poisoning. Cancer patients going through chemotherapy have suppressed/weakened immune systems. This means a little bit of bacteria that would normally give the average person a little bit of gas, can turn into food poisoning and several days of bed rest for someone going through chemotherapy. Remember to reference the USDA proper cooking temperatures guide and use a thermometer when cooking. Most importantly, avoid cross-contamination by continually washing your hands and sanitizing your surfaces when switching tasks while cooking. 3) Eat small food portions. As I have shown in my cookbook, nausea is one of the main side-effects of chemotherapy treatment. Eating large portions of food can make you feel even more sick but eating small portions of food will help avoid unnecessary nausea. Nausea will lead to the inability to eat and be counterproductive. Make sure to take home a doggy bag so you can eat your large holiday meal over several days. 4) Drink plenty of hydrating fluids. Holiday meals tend to be very salty so drink enough hydrating fluids to compensate. Dehydration can lead to an infinite amount of problems such as: nausea, dizziness, dry mouth, fainting, vertigo, and so many other terrible things. Drink plenty of fluids to keep your body hydrated and to avoid any unpleasant chemotherapy side-effects during the holiday season. 5) A little bit of vinegar goes a long way to combat metallic taste and lighten the weight of a recipe. The weight of a recipe can prevent a person going through chemotherapy from being able eat. Palate cleansing is one of my key cooking techniques to be able to successfully cook for cancer and chemotherapy patients. Using a little bit of red wine vinegar in your sauce, gravy, and casserole recipe will lighten the flavor and weight of the dish. This will give it a light, crisp, clean, finish that will allow anyone going through chemotherapy to be able to eat and enjoy the taste of their food again. And remember that sugar always follows vinegar.